Major issue is obviously definitional. There is a discrepancy (bordering on animosity) between the botanical definition (which relates to seed-bearing tissue) and the culinary definition (basically any plant matter that tastes sweet). Many foods satisfy the botanical definition but not the culinary definition (e.g. tomatoes, cucumbers). Fewer foods satisfy the culinary definition but not the botanical definition (rhubarb apparently). Google Trends as an empirical method of determining the extent of definitional controversy: Tomato and fruit / tomato and vegetable. Notice how they are evenly matched. Now consider apple and fruit / apple and vegetable. “Apple and fruit” dominates “apple and vegetables.” And rightly so. But then we can also identify some other gray areas. Cucumbers; squash; corn. Required reading. Cross-reference with forthcoming entry/entries on tomatoes. Fruit moulds. Not to be confused with mold on fruits. Consider development of Takery and Silver Univnron fruit moulds. 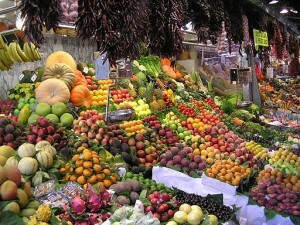 Fruitarian diets: How extreme you could take fruit only diet? Empire apple only diet? Perhaps each month or each year you take on a new type of food. So over the course of a lifetime you’ll have a balanced diet but month by month it is only focused on a single food. January 2013: banana. February 2013: Milk. March 2013: Salt. And so forth. Even when you eat a meal, each bite is going down at different intervals. You are simply changing the interval at which you receive those bites in a much more orderly way. Seem quite sensible when you break it down.